Whether you’re a long-time fan of Barn Light Electric or a more recent devotee, you probably know that we handcraft some pretty sweet barn lights. Lights with deep roots in the RLM shades of the early 20th century. The ones that every homeowner wants for their modern farmhouse. We offer a complete line of these classic barn lights from pendants and goosenecks to wall sconces and chandeliers. What you might not know is that we also craft a growing line of modern fixtures. 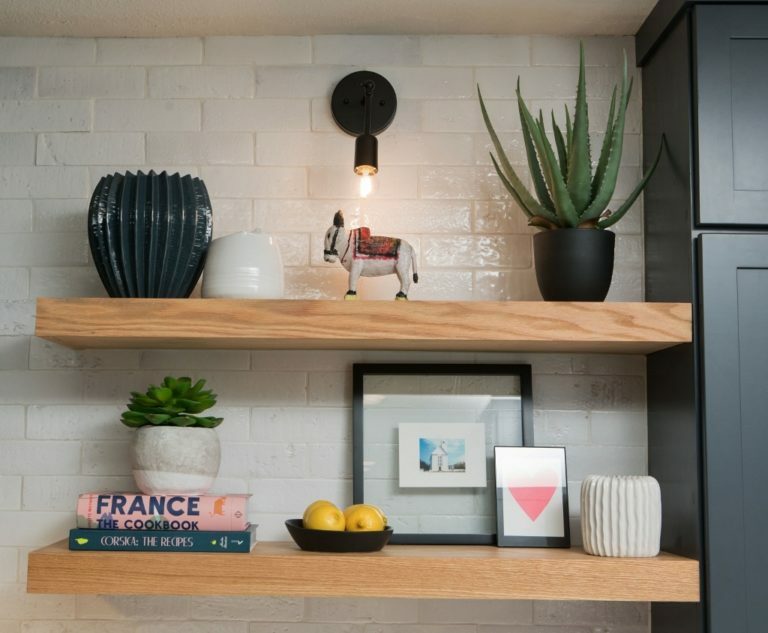 Today, we visit with Katie, of Katie Postel Interiors, in Austin, Texas, who recently tapped into some of our modern lighting for a remodeling project. 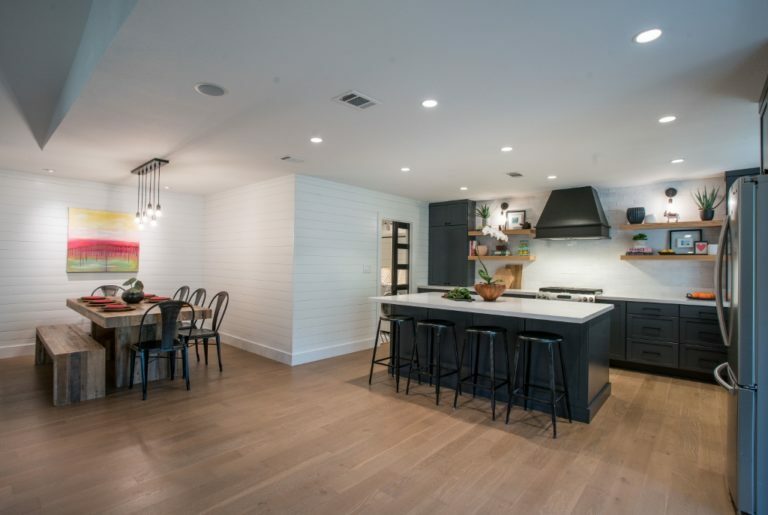 “This was a full-gut, down-to-the-studs remodel of a ranch-style home in Austin,” Katie says. 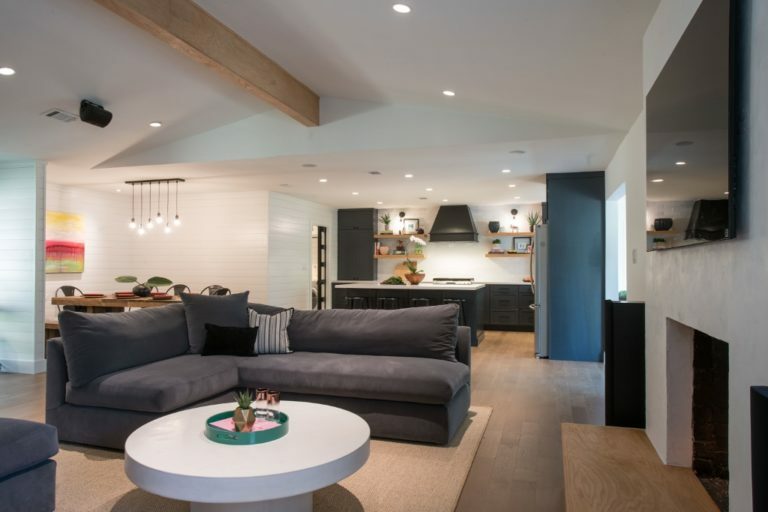 “We updated the kitchen, laundry room, family room, wet bar, and sunroom.” Walls were moved to create an open-concept layout for the young, active family of four. The design direction aimed at a modern, minimalist farmhouse feel but with a warm aesthetic. Katie achieved this with a high-contrast color scheme of navy and white mixed with warm wood tones. 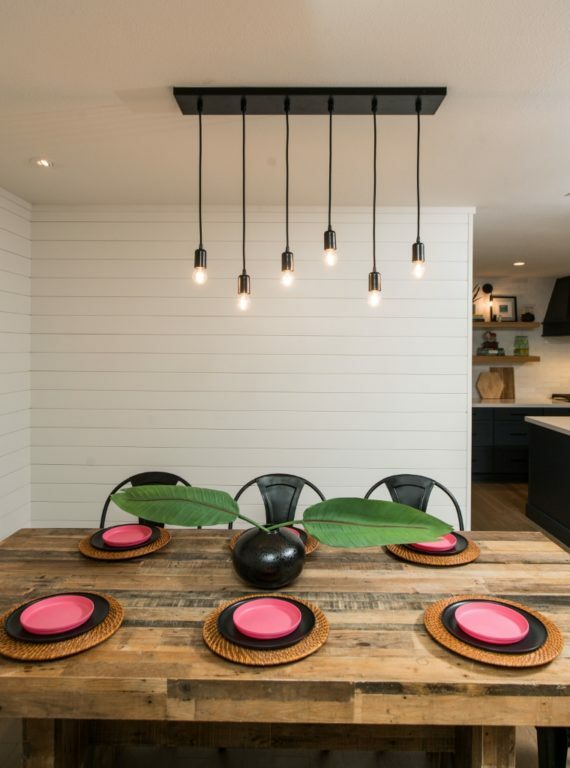 She added a contemporary touch with sleek, matte black plumbing and lighting fixtures. Like so many homeowners and designers, Katie discovered Barn Light on Instagram. A fellow designer posted pictures of a project featuring Barn Light fixtures and Katie fell in love with the customizing options offered. 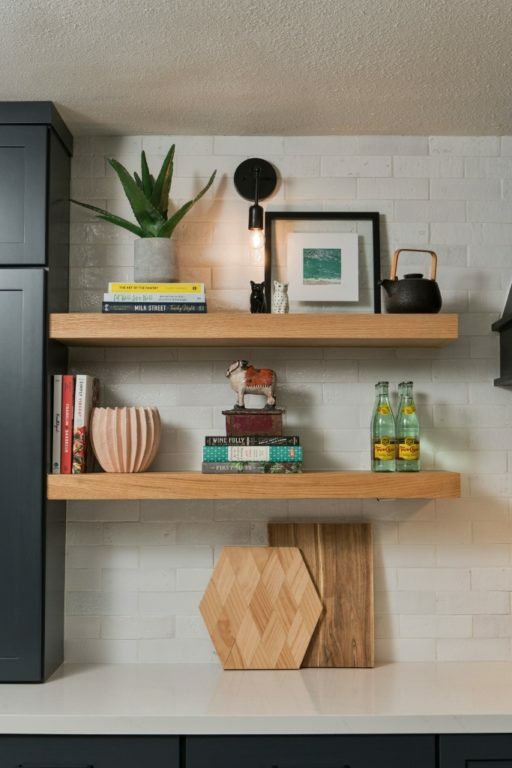 For this project, Katie chose the Downtown Minimalist Adjustable Sconce to highlight the new open shelves in the kitchen. 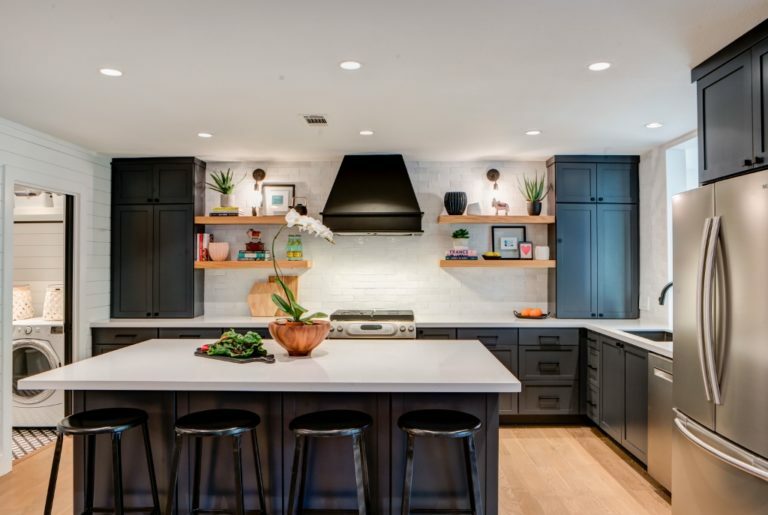 She customized these bare-bulb sconces with a Black finish to coordinate with the plumbing fixtures. 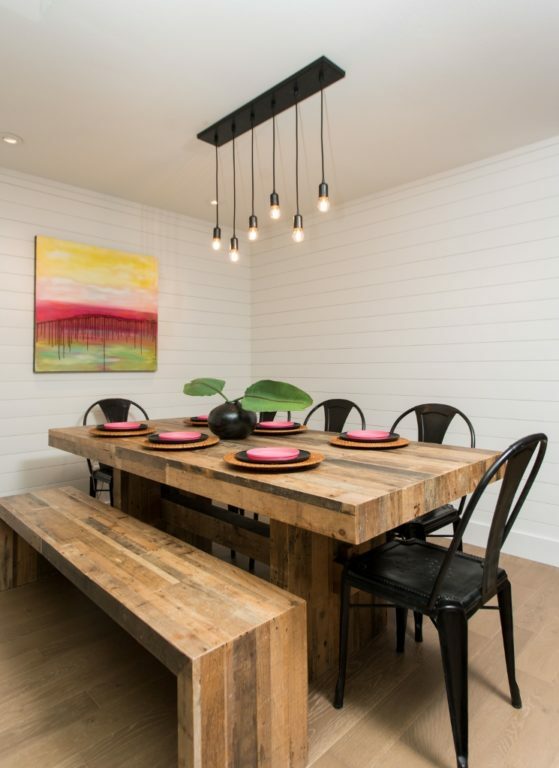 In the dining space nearby, Katie chose the 6-Light Pendant Chandelier to pour light onto the table. This multi-light chandelier is customized with a Black finish and Black cloth cords. Each individual pendant is adjustable to create the exact look and feel desired. This modern chandelier is also available in 3-light, 4-light, and 5-light versions which are easy to customize with one of 28 powder coat finish colors and 23 cord options.